Clarkspoons are highly proven for both salt and freshwater fishing. They are fast acting, have lifelike motions and can be either trolled or cast. Hands down favorite for Spanish Mackerel, Blues, etc. Clark Spoons are chrome, with a built in swivel which eliminates line twist and is exclusive in our product. 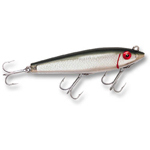 It's also equipped with stainless steel hook and a RED BEAD which is a proven fish attracter. It has been scientifically proven that using a monofilament instead of a wire leader is more effective in catching fish. It is also important to keep the fishing outfit and tackle in balance. If weight is required, sinkers (regular or swivel) and planers are an option. If using a planer, use 25' - 30' leader line beyond planer. All sizes of our spoons are compatible with both. � Length - from spoon to eye 3"